January 2015 - An Opportunity to Celebrate Life! What Was Your Ultimate Result? Any of you who have been following my blog know that I am a big fan of The Haven and regularly lead a program called Living Alive Phase I (LAPI) . I took LAPI 30 years ago as a participant. I know that was a LONG time ago. LAPI was a life changing event! Flash forward to today, and I find myself continually trying to introduce this awesome 26 day intensive program to as many people as possible. Unfortunately, people hear 26 days, and say, “Who can take off 26 days from their life to go do that? !” Sadly, for many, 26 days is just not an option. This year The Haven is launching a new LAPI format – The Integrative Living Alive Phase. This new program will take place over eight months and will combine onsite modules with ongoing online teleclasses, group experiences, and an online community for staying connected! I am thrilled about this one format! One, because I think one of the biggest challenges people face after having a transformational experience is integrating that experience back into their day-to-day life. So the idea of having both onsite, and at home experiences, presents the possibility of integration as you go! Secondly, this new format was partially inspired by my educational process through Martha Beck, who offers her coaching process over 9 months, which I took and thought worked really well. So I am really excited about offering this new format at The Haven, making learning available both face-to-face and online. Also this is providing me, The Haven, and others, a chance to look at how we are marketing The Haven and possibly finding new avenues and audiences. Thus the title of this post: the Ultimate Result. Research: What Was Your Ultimate Result? I am doing research. I would love to hear from any of you out there who have participated in a Phase I program recently, or a LONG time ago. For me the ultimate result was learning how to create more intimacy and connection with people. I discovered in my Phase how my stories and history were so projected on the world around me that I really did not have any significantly close current relationships. During the Phase I discovered what was possible when I stepped out of my story and got interested in the other person. Up until that program, I had been living in a very scarey narrative. It took the Phase, for me to realize the “war” from my childhood trauma was over, and I could be open and revealing of myself to others. I could also be interested in them without having to constantly project that old story. So that’s one example. But I imagine there are a variety of ultimate results out there. Share yours! (There’s an easy form just at the bottom of this post!) I would love to hear it. Also, if you are interesting in learning more about the Integrative Phase program, please contact me or call the Haven. I’ll keep you posted as we launch our new program. It is a whole new program. 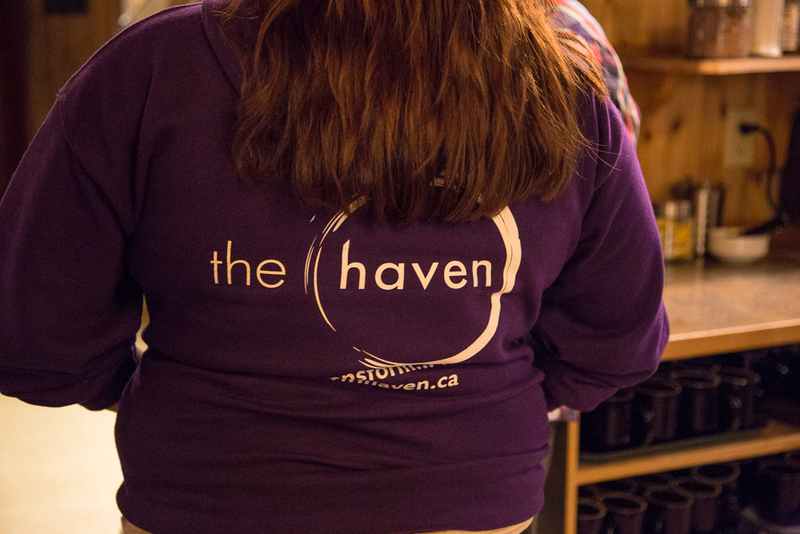 So even you graduates who would like to have a integrative experience of Haven, over the course of eight months, why not join us again?! 2015 started with us making a long trek to pick up our new family member, Rosie!! We had been looking for our new dog by visiting the local shelters often. I had hoped to find a great match for us there, but it wasn’t happening. The dogs that seemed to be good fit were quickly taken, and it wasn’t easy going into the shelters and seeing some of the same dogs there time after time. Part of me longed to bring one of those dogs home, but I know I am not the right match for a dog that is too anxious, or aggressive, or needs extra help adjusting. So we decided to try a different strategy for finding our doggie. Instead of actively looking, we sat down and started discussing what we loved about Sooke and our other dogs. What worked, and what didn’t, for us. We created some critical qualities for both of us. We then called on Sooke, whose spirit we know is still right here with us, to help guide us to our next dog. Well, let’s just say, the results of this more energetic effort, were FAST!! 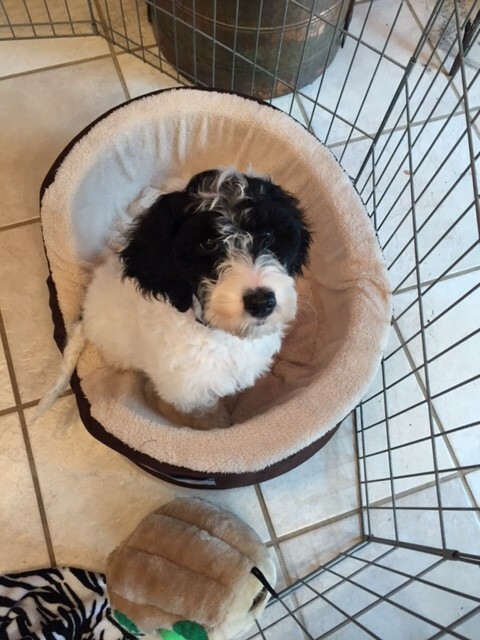 That same day, not two hours later, our good friend, Susa Holt, sent us an email and shared about her brand new Sheeperdoodle puppy AND that there was one more female in the litter needing a home. BTW, Susa mentioned that she was headed back to the breeder’s that very same afternoon, and could put in a good word for us and check out the available puppy. We had never heard of a Sheeperdoodle, but had been interested in the “doodle” doggies previously. We did some quick research and soon discovered the qualities were amazingly in line with our list. Aside from the long trip, this has been a significant reminder of the magic in practicing visioning, and aligning, to manifest what will come next – be it a puppy, a house (we’ve done that couple times now) or new business. It’s all very exciting. I am aware that I want to avoid become a totally neurotic puppy parent. There are some early signs that I will have to work hard to not let Rosie become a spoiled little one. I want to stay on the path towards training, and establishing some solid boundaries and clear guidelines. As I write, Rosie is sleeping in her gated play area. There are probably too many toys inside, but she’s learning to settle in her own space, and we are learning to let her whine. Unless you are a dog person like me, you may not be as interested in this post. However, I am hoping that the real take away is to remember that if things are not happening quite the way you like, stop trying so hard to make them happen. Instead, pause, and spend some time getting really clear about what you want, the qualities, the way you want to feel, and for a few moments stop worrying about how it will happen. Amazingly things start to happen when I stop thinking that I have to make it happen. Thanks for Rosie, Universe! I am sure I will need to be reminded of these steps when I start forcing Rosie to comply to my will. I imagine CrisMarie will be all too willing to encourage me to – stop trying so hard, pause and get clear, let go of the how and wait. I imagine Rosie will get more from that tactic than she will through my forced compliance! Watch this is a short video clip – listen carefully to me in the background – demanding accomplishments from a 10 week old pup. Not my proudest parenting moment! It’s time for some more house training! Got to go take Rosie outside!! Wish me luck!